Angada is a vanara who helped Rama find his wife Sita and fight her abductor, Ravana, in Ramayana. He was son of Vali and Tara and nephew of Sugriva. 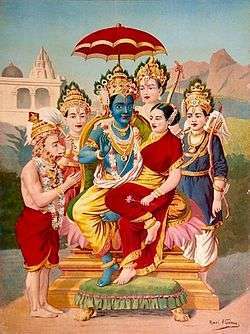 Angada and Tara are instrumental in reconciling Rama and his brother, Lakshmana, with Sugriva after Sugriva fails to fulfill his promise to help Rama find and rescue his wife. Together they are able to convince Sugriva to honor his pledge to Rama instead of spending his time carousing and drinking. Sugriva then arranges for Hanuman to help Rama and organises the monkey army that will battle Ravana's demonic host. At Ravana's court, after Angada explained the divinity of lord Rama and the message he carried, Ravana paid no heed to it. Angada then planted his foot firmly on the ground and challenged anybody in the courtroom to uproot his foot. If anybody were to accept the challenge and was successful, Rama would concede defeat and return without Sita. 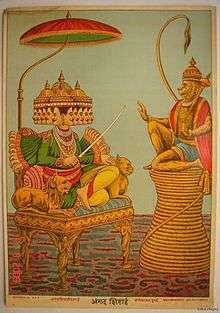 All rakshasa commanders of Ravana's army and even his son Indrajit tried to lift Angada's leg but none succeeded. Feeling humiliated by this failure, an infuriated Ravana slowly walked towards Angada's planted foot and just as he was about to hold Angada's leg to attempt the challenge, Angada moved away and Ravana fell down. Angada explained that the challenge was for Ravana's commanders and not for Ravana. He told that Ravana was prepared to fall on his feet but, instead he should choose to fall on Lord Rama's feet, for those are the ones that remove fear of cycle of life & death. He then picked up Ravana's crown which fell down on the ground and threw it out of the palace. Ravana ordered his men to kill Angada but then Angada took a jump and flew back to the place where the army was congregating. When vanaras saw the flying crowns approaching, they got frightened. But Rama knew that it was the crown of Ravana. The crown fell on Rama's feet. In the war that followed, Angada killed Ravana's son Narantaka.